Prepare your weapons, invite your friends and join us for an EPIC Nerf War in our Main Auditorium on February 21st from 6:30pm-8:30pm. The event is $2 if you sign-up online by February 18th or $5 to register at-the-door (a signed medical release is required). Darts, safety glasses, and snacks are provided, but every kid must bring their own nerf gun to play and have a signed medical release in order to play (we recommend that you download the medical release form during registration, however we will also have copies available when you arrive to the event). 1. What type of gun will my child need? The darts we provide are the blue nerf-darts with the orange tip. They are compatible with most Nerf Guns, but work best with the N-Strike series. 2. Can my child bring darts with them? We are providing darts. If your child brings darts to the event, the darts will not be returned at the end (just imagine trying to sort out hundreds of darts and having kids argue which one belongs to which kid. Not worth it.). We will have thousands of blue darts with an orange tip that the kids can use. 2. What will 1st-6th grade do? 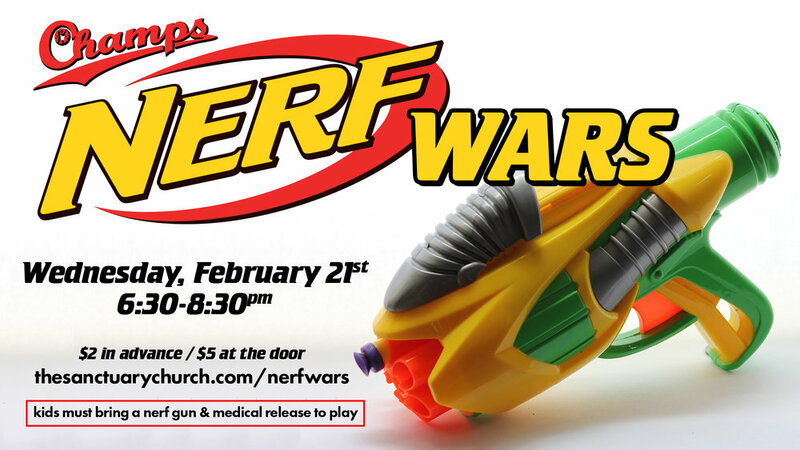 There will be multiple rounds of Nerf War, snacks and prizes for kids that bring the most friends. If more than 100 kids sign-up in advance, we will open up a second arena in order to maximize play-time. You must bring a Nerf Gun with you and have a signed medical release in order to play. 3. What will 3 years to 6 years do? This year we will be setting up a target shooting course for kids 3-6 years old so that they can join in on the fun. These younger ages will not be allowed to participate in the larger Nerf Wars. 4. Do parents drop off or stay? Parents can either drop off their kids or remain at the event to watch. If parents choose to stay at the event to watch they must remain in a "parent lounge" during the event. They cannot enter the arenas or snack areas and cannot check-out their kid until the end of the event.